If there is a player who is becoming a runaway leader, players should make a serious effort to ally against them whenever that player is involved in an encounter. This is also true for when a player gets a very powerful alien power that can become out of hand. In a similar vein, if a player who is really lagging behind is involved in an encounter, it will probably be in your best interest to not ally against them, unless it would mean victory for you. Some might say “It’s only a win if you do it by yourself” but that’s just not in the spirit of Cosmic Encounter. Share the Win with someone else, two someone else’s or better yet, with everyone except for the guy who attacked you in round one. That’ll teach him! Seriously though, this game can be a ball of laughs at the end if you share your victory with some other people. And if you don’t, you’ll probably lose unless you’re really crafty and the second place guy can’t rally the table. And be wary of permanent foreign alliances. I’ve played games where people tried to “team up” for the majority of the game, and CE is not a team game. Managing alliances is a key to the game, and always remember it’s just a game. You’ll need to cajole, connive, and burn some bridges in order to get the victory. Instead of giving each player 2 alien powers to choose from, let each player choose from 3 or 4. It will take players a little longer to make a choice, but they will probably enjoy getting more options to choose from. Don’t ask for help anytime you’re uncertain. Part of the game is bluffing! If you always ask for help then you’ll probably wind up sharing a victory and/or losing to other opponents you invited along! While this depends on who you are playing with, but in my group the person with the most “OP” alien will inevitably be a target when possible, and will receive very little aid when it’s needed. That’s why my favorite cards are ones like Philanthropist or Healer. No one can get mad at you since your still helping them the whole game, and since your alien power is weak in combat people will underestimate you (and they will regret it since you’ve been hoarding strong cards all game). Deal out three powers to each player. They take one, discard one and pass the last one to the left. So you get one of your choice, get to decide on one NOT being in the game, and one you MUST play. This really helps you learn the power strategies well. NOTE – This variant should not be played unless ALL players are very familiar with the game. Playing as Masochist or even Zombie? Throw those negotiation cards out whenever you can! In the case of the former, they provide an easy way (through refusing to deal) of killing 3 of your ships if your enemy seeks to avoid hurting you. For the latter, if you don’t have any strong encounter cards, don’t be afraid to once again refuse to deal, as in doing so only your opponent will be weakened. Zombie diplomacy is only ever painful for party with living-brains. While I normally play this game just for the pure chaos and fun, when I really want to win, I’ve found that one surefire way to do this is to draw cards whenever I get the chance. While it can be tempting to always ally with the attacker because of the lure of winning a colony, if you want to win all by yourself it can be more beneficial to ally with the defender to accumulate an impressive hand of cards. This will give you access to the awesome power of flares and artifacts, as well as a greater range of attack cards. It also gives you more bluffing power. However, be aware that this game is mostly about enjoying the journey, and victory cannot ever be guaranteed. This strategy should help though! 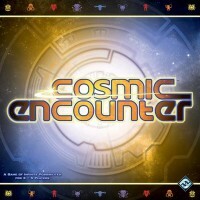 While I would not call Cosmic Encounter a difficult game to learn, the game and its multiple phases can be overwhelming enough for players without the addition of flares, tech cards and other expansions. Keep it simple with a basic game without some of the (admittedly fun) clutter and chaos! I thought that I read this tip here, maybe it was buried in the rule book. Anyway, we started half of our games with our alien cards hidden until their power was first activated. This was a really fun option, and a couple of people almost got to winning the game before they flipped their card. The time that someone played with the Masochist though, we almost all got screwed by this option. It’s quite useful if you can keep track of wich flares and artifacts are still in game. This way you won’t be surprised when a card or power zap is played on you and screws you. In the same manner you can hold some powerful artifacts like the zaps, moebius tubes and plague and use them when it’s gonna hurt your opponents most. Some copies of the game was, due to some error, shipped with an extra space ship in one of the colours. Instead of just leaving this ship lying around as a spare part paint it in a different colour from the other ships, like gold, and use it as the prometheus ship instead of the cardboard token that comes with the game. I own about 4 versions of this, and have played ALL the incarnations of this game, as it is one of my favorites. It is important to keep in mind that CE is not a serious board-game. It is HIGHLY social, and frequently imbalanced as my group likes to call it a F**K or “screw” Your Buddy type of game. If you have a stoic type of group who can’t let loose or takes their games too seriously…I suggest finding a different type of group to play with! The sequence goes like this: Magician plays a card face up, then Oracle plays two cards, then Magician adds one of them to his hand (without changing his own encounter card). This allows both players to still get a benefit out of their power. If another game effect requires you to play your card first (e.g., Oracle, Wild Magician), you must do so. You then still use your power, but may not change the card you played. Gambler says “Do Not Use with Sorcerer,” but this restriction is completely unnecessary, and easily overcome by simply allowing Gambler to still bluff about the card he originally played; in this case, Sorcerer must then accept or challenge Gambler’s claim about the card Sorcerer is about to reveal (and may not look at it if he accepts the claim). If another game effect switches the encounter cards (e.g., Sorcerer), you may still bluff about the card you originally played, forcing your opponent to accept or challenge your claim about the card that he or she would now reveal. If another game effect forces you to show your card early (e.g., Oracle), you may use your power at that time. We sometimes (when in a punchy mood) play Multi-Blinds. Three powers, all played face down. No powers are in force that are not showing. When you want to have a power at your disposal, turn it over and reveal it. Losing by 14? Turn over the Virus and win by 49! About to lose a lot to the warp? Flip that Zombie up. The trick is that you cannot have more than two powers in play at any one time. So you will have to decide which one to lose each turn. Makes for some crazy games. Discard citadels if their planet is destroyed or this sheet leaves the game.